The IAWF was delighted to become affiliated with the GTC (Guild of Television Cameramen) in January 2016. Our worldwide membership includes many of the leading names in our industry. The GTC (of which IAWF members are also members of course) now has an updated and efficient email forum for sharing information and asking questions. Let's get involved. 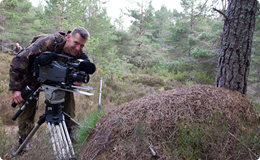 Expert advice from John Waters on getting started, and the trials and rewards of pursuing a wildlife filmmaking career.